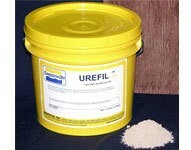 URE-FIL Fillers are easily dispersed in most Smooth-On resins and rubbers to attain different finishes, properties and effects. Filler can act as an extender - lowering the cost of each casting, can provide casting effects, or can thicken a material, depending on formulation. URE-FIL 3 is a ceramic filler that is speckled grey in color and will give plastic castings a ceramic or porcelain-like finish. Directions For Use With A General Purpose Resin: Application of a release agent is necessary to facilitate demold. Universal Mold Release from Smooth-On is recommended. 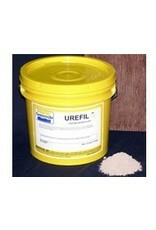 URE-FIL fillers must be thoroughly dispersed in Part B to a uniform consistency before adding Part A. If using a general purpose casting resin like Smooth-Cast 300, a mixture of One Part A, One Part B and two parts filler by volume (1:1:2) yields a castable resin that cures at room temperature in about one hour. A mix ratio of one part A, one part B and four parts filler (1:1:4) yields a resin that has a paste-like consistency.